We now have a product that can help treat the signs of aging on the HANDS! Hand creams can only go so far. Restylane Lyft is the first and only HA injectable filler FDA approved to reverse the signs of volume loss in aging hands. We are once again honored to have achieved Presidential Executive status with Aspire Galderma Rewards. This is a testament to our amazing nurse injectors and out loyal patients. Way to go! The Barber Center now has Celluma®, an LED light therapy that is an effective treatment for facial rejuvenation, acne and wound healing. It can be done as a stand alone treatment, 24-48 hours prior to treatments such as Rejuvapen®, chemical peels or IPL to enhance results or 24-48 hours after these treatments to expedite the healing process. We are VERY proud of this accomplishment! 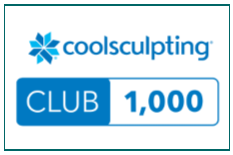 The Coolsculpting 1000 Club means we’ve completed over 1,000 treatment cycles and helped hundreds of patients achieve their body contouring goals. The Barber Center is honored to have achieved Presidential Executive status with Aspire Galderma Rewards for 2017. Kudos to our hard working staff and wonderful patients. Allergan, the manufacturer of well known medical products such as Botox® Cosmetic and the Juvederm® family of products, has acquired Zeltiq, the manufacturer of Coolsculpting®. What does this mean for you, the patient? It’s still too early to tell but we foresee only good things for patients such as reduced treatment costs when utilizing the Brilliant Distinctions rewards program. We will keep patients informed going forward. If you’re interested in learning more about Coolsculpting® or any other product or service we offer click here to contact our office. Allergan has launched the newest FDA approved dermal filler in their portfolio for the treatment of facial wrinkles and folds. Juvederm Vollure™ XC has been used successfully in Europe since 2013 and the Barber Center is excited to be one of the first practices in Greensboro to offer it! The Barber Center is excited to announce several great advancements in the Coolsculpting® treatment offered at our practice. Many patients have asked for it and now it’s a reality! Coolsculpting® is FDA-cleared for treatment on the upper arms! As if that weren’t good enough, the Barber Center now has the Advantage applicators which in many cases can cut your treatment time from 60 minutes to only 35 minutes! Call today or visit the Coolsculpting® page to learn more about this revolutionary treatment. 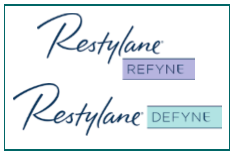 Galderma has added 2 new injectable dermal fillers to their Restylane® family of products. The Barber Center now has Restylane® Defyne and Restylane® Refyne as part of our dermal filler arsenal. These next generation hyaluronic acid (HA) dermal fillers utilize innovative XpresHAn™ technology to provide natural looking results with minimal downtime. To learn more about these products and find out if it is right for you, schedule a no-cost consultation with one of our registered nurses today! Check out the current issues of Yes! Weekly, New Year New You. There is a fun and informative article that highlights fabulous local businesses, including the Barber Center, that can help promote a new, healthier, more positive you in 2017! We are excited to announce that we are the first office in Greensboro to offer Juvederm® Volbella XC. It is an exciting new dermal filler designed for treatment of fine lines and wrinkles around the mouth, commonly known as smokers lines. In addition, it is perfect for adding subtle volume to the lips. To learn more about this product and to find out if it is right for you schedule a no-cost consultation with one of our registered nurses today!